Increment and Decrement Operators in Java are used to increase or decrease value by 1. For example, Java Incremental operator ++ is used to increase the existing variable value by 1 (i = i + 1). And the Java decrement operator – – is used to decrease or subtract the existing value by 1 (i = i – 1). This example helps you to understand the Increment and Decrement Operators in Java practically. This Java program allows the user to enter two integer variables i and j and we are going to use these two variables to display the functionality of Java Increment and Decrement Operators. 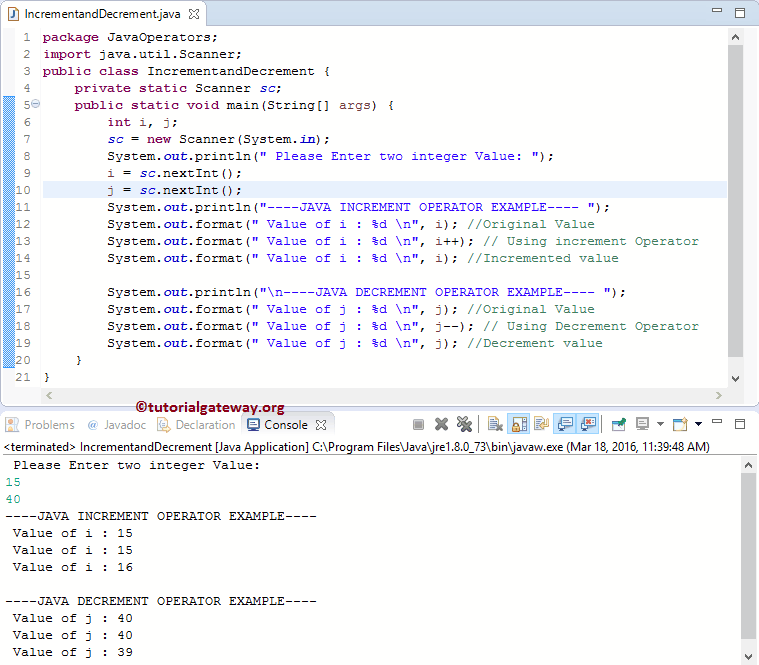 In this Java Increment and Decrement Operators example, the following statement will ask the user to enter integer values i, j. Next, we assign the user input values to respected variables. At Line 13 we used increment operator. It means the value of the i will be returned first (i.e, 15) and then i value is incremented by 1. Line 14: We called the i value again and this time it is displaying 16 because value is updated already. Same with the decrement operator. If you observe the above syntax, we can assign the increment and decrement operators either before operand or after the operand. When ++ or — is used before operand like: ++x, –x then we called it as Java prefix. If ++ or — is used after the operand like: x++ or x– then we called it as Java postfix. ++i (Pre increment): It will increment the value of i even before assigning it to the variable i.
i++ (Post-increment): The operator will return the variable value first (i.e, i value) then only i value is incremented by 1. –i (Pre decrement): It will decrement the value of i even before assigning it to the variable i.
i– (Post decrement): This operator returns the variable value first (i.e, i value) then only i value is decrements by 1. NOTE: Though Java increment and decrement operators are mostly used in For Loop, While and Do-While loops. Here, we have not given any example, because it was too early to understand the loops concept. Try to understand the concept of the Java prefix and postfix. So that you can understand if statement, for loop, while loop and do-while loop syntax easily.